The first Thursday Night Supper was at Adam's and my house, and we felt the pressure to create a fun, memorable, and delicious dinner. For weeks, Adam has been wanting to make sushi since he swears he could eat only sushi for the rest of his life. We decided to try it, and figured we should do it right! So we wandered to Beaverton to hit up Uwajimaya, a "quality Asian grocery" since they were sure to have everything we needed. Our appetizer was fresh spring rolls. I always order them when we go for Thai food and I figured if Adam was going to attempt sushi, I could do spring rolls. Turns out, they're really easy! Cook the vermicelli noodles in boiling water for 5 minutes, strain and run under cold water. Cut tofu into strips about 1/2 inch thick. Cut the cucumber and carrots into strips, wash the lettuce and chop the cilantro and basil. Saute the tofu for a few minutes on each side until slightly crispy with a little olive oil, or for more flavor mix in some sesame oil, soy sauce, and ginger. Fill a bowl with warm water and place one rice paper in until soft. Take the rice paper out (and put another in) and lay on a damp kitchen towel. Fill the rice paper with all your fixings. Roll it up, cut in half, and serve with peanut sauce! Cook the rice according to the package directions. When cooked, pour the rice out on a cookie sheet and fan while sprinkling with a few tablespoons of seasoned rice vinegar. Avoid buying the plain rice vinegar, because then you'll have to make it seasoned with sugar and salt. Once the rice has cooled, lay out a sheet of nori (the seaweed flat square) on the bamboo rolling mat. 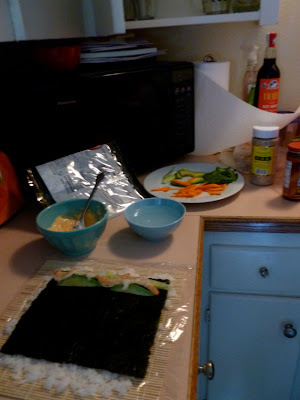 Leaving an inch on each end, place a thin layer of rice over the nori. Lay your desired ingredients for that roll in a strip on the end closest to you. In our case we did a few rolls with shrimp, avocado, and cucumber and a few with raw tuna and cucumber. Mostly we just mixed and matched! Roll it up, tightly, and using a serrated knife with a little water on it cut into pieces. 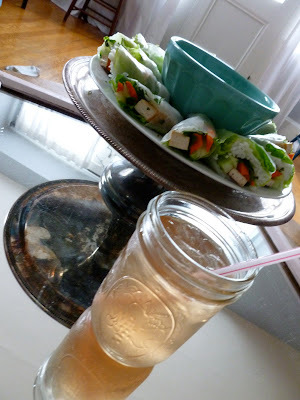 Place the rolls on a plate and serve with pickled ginger, wasabi and soy sauce. Other sushi roll ideas if you aren't comfortable handling the raw fish could be California rolls with crab or using smoked salmon with a little cream cheese and cucumber. Also, a couple bonus tips: If you want the rice on the outside, lay down a sheet of plastic wrap over the bamboo sheet. And if you're a fan of some spicy mayo, just mix mayonnaise and Sriracha sauce. So easy! Of course each meal needs a good DRINK! For this Thursday night, I (well really Katie made them!) recreated the drink that Katie and I had at Ping. We wanted the rhubarb, but that isn't sold "retail" so pomegranate was the next best option. 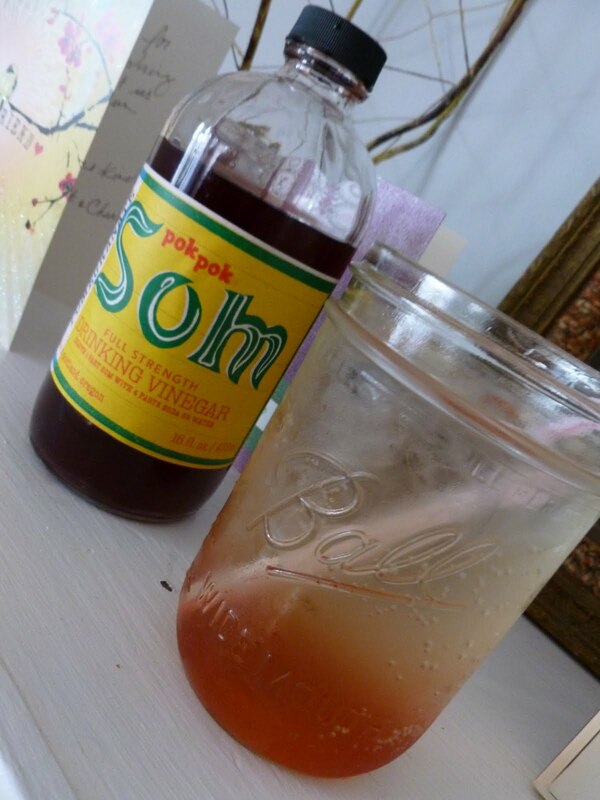 Mix 1.5 - 2 ounces gin, a little Pok Pok Som (depending on how much flavor you prefer), then fill cup with ice and club soda.